Arleil Schous has been known to hang out both in Chalmun’s cantina and Ackmena’s cantina. As fierce as this guy looks, underneath it all he can be very timid when threatened. During one particular instance in Ackmena’s cantina an Abyssin named Cyceyed threatened him with a knife, and he practically squeaked with fear. The Abyssin was unceremoniously tossed out afterwards. 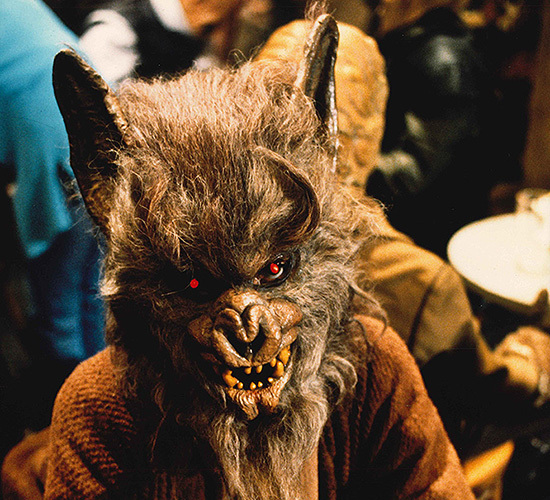 There are two different “Wolfman” masks that were created for A New Hope. The other one is more hyena-like and was called “Hyena Man” during shooting, while this one with its glowing red LED eyes was called “Wolfman” (but actually looks a bit like a bat!). 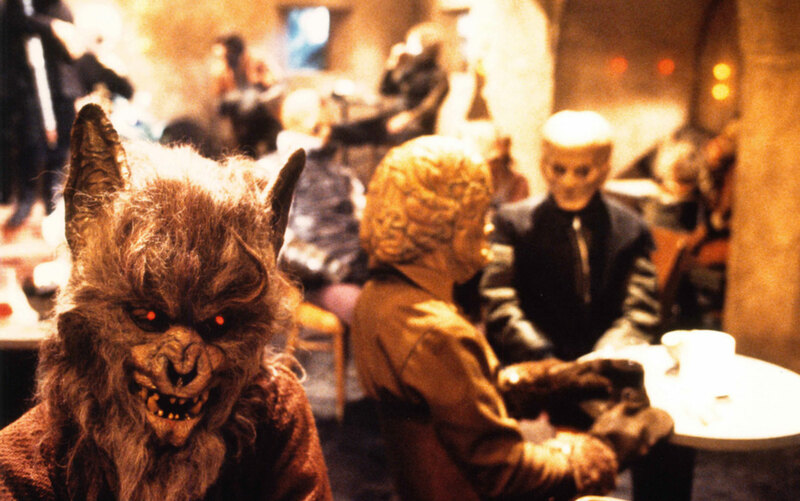 The Hyena Man mask is much more visible in A New Hope, while the Wolfman mask is very prominent in The Star Wars Holiday Special. 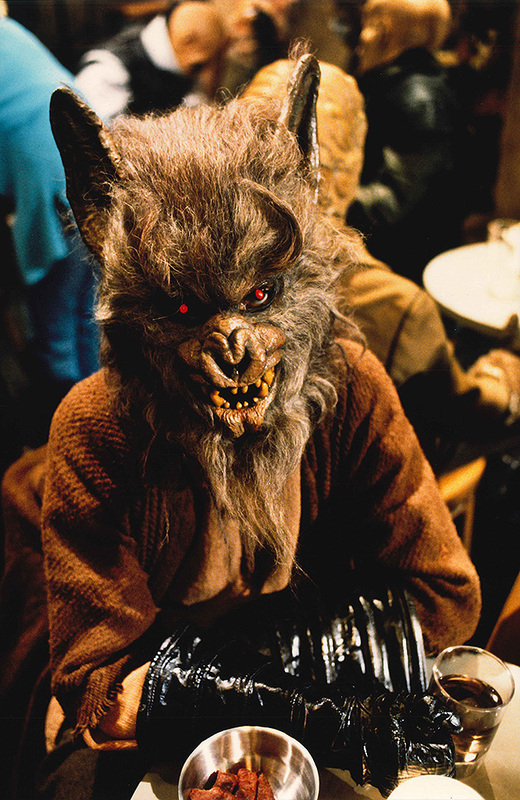 Previously this mask had been used by Rick Baker on a 1974 Halloween live show called “In The Attic”. 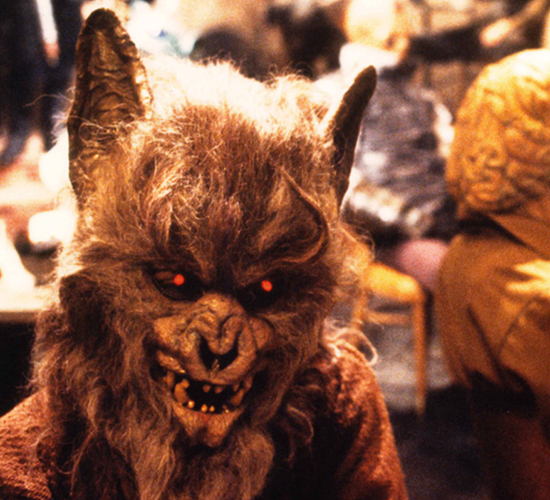 In 1989, West End Games’ Galaxy Guide 4: Alien Races book identified this Wolfman creature’s race as Defel. In 1998, Decipher’s Star Wars Customizable Card Game gave the creature a card and named him Arleil Schous. The name is an anagram of Decipher employee Charles Louis Kallenbach’s first and middle names.